UNKNOWN to many, a banker-turned-developer is in the midst of transforming a 100-acre ex-tin mining tract in Kampar into a RM1.8 billion tourist attraction and student hub. 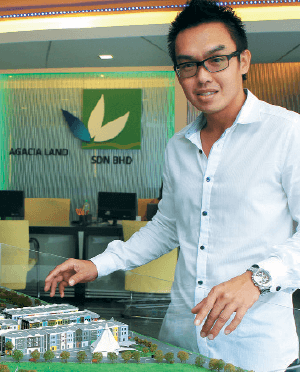 Agacia Land Sdn Bhd president and CEO Datuk Michael Lim bought the sizeable parcel, now known as Bandar Agacia, in 2010. With two phases of the project underway, the Kuala Lumpur-based company unveiled the third on June 13 — a mixed-use development that bears the same name as the famous Avenue des Champs-Élysées in Paris, France. The Champs Élysées development is a 24-storey building occupying 1.5 acres. Boasting Gothic architecture, it features serviced suites and 30,000 sq ft of commercial space on the ground floor and has a gross development value (GDV) of RM151 million. Its residential component offers 629 studio suites (430 sq ft for standard units and 450 sq ft for corner units), two 2-bedroom suites (860 to 900 sq ft) and a 1,300 sq ft penthouse. The fully furnished suites come with one to three balconies. The studio suites are priced at RM206,600 upwards; 2-bedroom suites, RM400,000; and the penthouse, RM2.9 million. 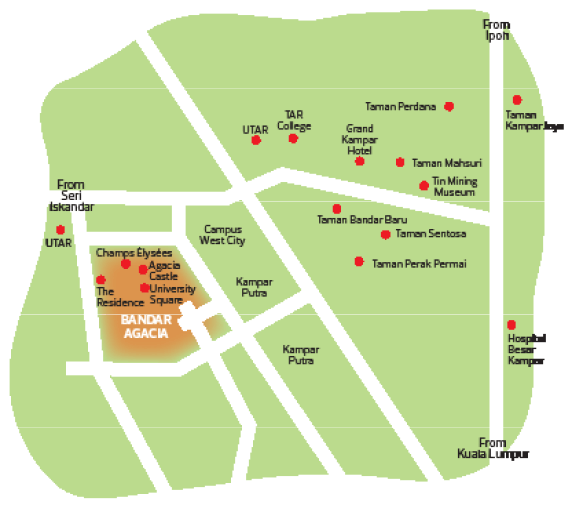 Some 160 units are reserved for a hotel operated by Agacia Hotels & Resorts Sdn Bhd. The commercial space is not for sale and will be home to Agacia College, which will be run by Agacia Education Group Sdn Bhd. Facilities include a gymnasium, swimming pool, 560 parking bays on levels one to six on the podium and 140 open parking bays at the ground level. Bandar Agacia’s master plan reflects Lim’s fascination with American and neoclassical European architecture. “For Champs Élysées, we wanted to incorporate a Parisian design, so we sent a team to Paris to study the architecture of the buildings along [Avenue des] Champs-Élysées. We try to stay away from modern designs as we feel they may go out of fashion faster than, for instance, neoclassical European designs that have stood the test of time,” says Lim. He adds that the Champs Élysées suites are aimed at addressing the accommodation needs of students of Agacia College and around Kampar. Levels 19 and 20 of the building are reserved for Agacia College, should it expand. “The suites are designed with the students in mind — each unit will have two beds. Although they may sound small, their interiors are designed to look spacious. They even have a kitchen and dining area, and are equipped with two study tables,” Lim says, adding that investors can also rent their units to tourists. As we are browsing through the brochure featuring an artist’s impression of Champs Élysées, an eager Lim points to a “castle” standing next to the development and says Agacia Castle will be built under the third phase of Bandar Agacia. Occupying one acre, it will resemble Disney’s Cinderella Castle, complete with spires, turrets and royal blue rooftops. Agacia Castle will house three hotel suites — an extension from the Champs Élysées hotel rooms. With a banking and finance degree, Lim has worked in two banks before joining the property development sector, where he rose through the ranks to become CEO of a company. Then, he formed partnerships for projects and started his own company. Lim says he decided to venture into property development because he believes the sector holds a lot of opportunities. 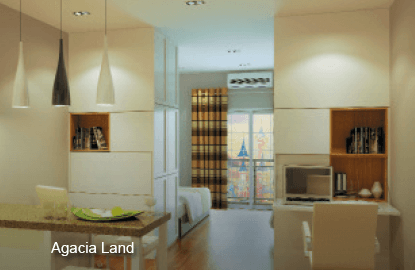 Agacia Land launched its maiden residential project, The Residence @ Kampar, also known as Trails of Kampar, in June 2012. The project, which is the first phase of Bandar Agacia and has a GDV of RM70 million, features 258 fully furnished units of American-inspired “townvillas”. The 1,099 sq ft units were sold for RM248,000 during launch. The development is now close to completion and is fully taken up, except for 10 units which are reserved for company directors, and another 50 to be used as hotel accommodation. A unique feature of the gated-and-guarded Trails of Kampar is the American-style clubhouse, which houses six indoor badminton courts, an indoor basketball court, a gymnasium, swimming pool, function hall and café. Lim says the value of the townvillas has appreciated to about RM428,000 since its launch. The second phase, University Square @ Kampar commercial hub, was also launched in June 2012. The 18-acre development features 57 Disney-inspired 3-storey shoplots and 13 modern 3-storey shopoffices. The starting price of the shoplots, which offer 57 different façades, was RM768,000 during launch. Nearing completion, this phase is 85% sold and the units are now going for RM1.1 million. The shopoffices, which have glass frontages, are designed for businesses such as banks and car dealerships. According to project manager Stanley Kow, the first two phases are awaiting their certificates of completion and compliance. The third phase will start soon and will be completed by 4Q2018, he adds. Lim says 25 acres in Bandar Agacia have been sold to another developer for a residential project known as The Meadow Park @ Kampar. Bandar Agacia is situated two hours from Kuala Lumpur and 30 minutes from Ipoh by car. The amenities in the area include Universiti Tunku Abdul Rahman (UTAR), Kolej Tunku Abdul Rahman, West Lake International School, Tin Mining Museum, Grand Kampar Hotel and Tesco, Giant and Econsave supermarkets. Thanks to UTAR and other educational institutions in Kampar, the student population has kept the market buoyant. “Kampar, being an education town like Nilai and Semenyih, will not fail,” Lim says, adding that even during slowdowns, such towns will continue to do well. She adds that residential properties have appreciated 10% to 20% over the years. The current average transacted prices of 1-storey terraced houses are between RM150,000 and RM200,000; 2-storey terraced houses, between RM220,000 and RM270,000; 3-storey terraced houses, between RM470,000 and RM560,000; and 2-storey semi-detached houses, between RM330,000 and RM500,000. On the contrary, an industry consultant who requested anonymity says there is an overwhelming supply of condominiums in the university-town. “Although property values are rising, transactions have plateaued due to an oversupply,” he adds. Nevertheless, Lim remains confident of Bandar Agacia. He says while other developers’ projects cater for the students, with low to medium-end products, Agacia Land is offering something different. “There are 39 developers in Kampar, including us, and we are the first to bring in high-end developments. There are 10% to 15% of UTAR students who come from high-net-worth families whose main concern is the security and comfort of their children ... which is why our developments place importance on security,” he says. It may not be a good time to launch projects now in view of the slowdown, but Lim is upbeat about Champs Élysées as “more than half of the 632 units are sold”. “Sales were good before the implementation of the Goods and Services Tax, and we sold over 340 units during the pre-launch in February and March. Sales are still coming in, but slower,” he says. Future developments on the remaining 25 acres in Bandar Agacia will include a RM1.5 billion mixed-use project comprising 10 residential towers and two rows of 2-storey duplex shops.